On Sunday night, a fourth explosion in a series of bombings was unfortunately triggered in Austin, Texas. Two men were injured from the explosion after unknowingly setting off a tripwire while walking through a residential area in Travis County. Since March 2 and before the explosion on Sunday night, the bombings had all been conducted in the same fashion. The device would be planted in a cardboard box and left outside a resident’s home. As soon as the resident were to pick up the package, it would explode. This method of delivery has already killed two people and critically injured two more, making this issue a severe security threat to the entire city of Austin. Because of the frequency and similarity of these bombings, it is likely that a serial bomber is the culprit to these attacks. As of now, authorities are desperately trying to figure out the motives of this bomber and what his/her motives are. Originally, the attacks were suspected to be racially motivated because they were set off in largely minority run communities. But after the bombing in Travis County, (a majority white suburb), the idea of this being a hate crime has now been scrapped. “We don’t know why the bomber is doing this. We don’t know his reasons,” FBI special agent Christopher Combs continued, “We would really like the bomber to contact us so we can talk to him”. 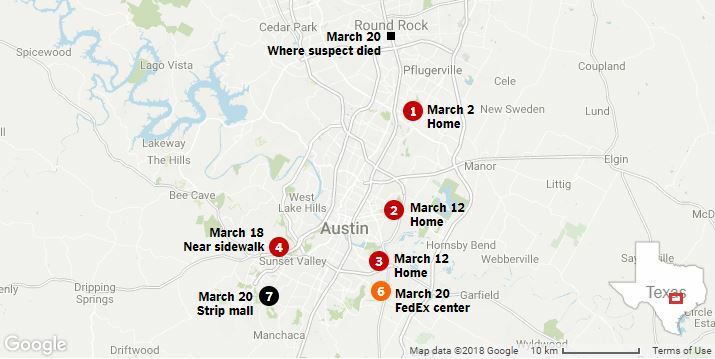 As the city of Austin sits on edge, investigators and authorities will continue to work diligently and bravely in their effort to find the bomber. With such little information left behind by the perpetrator, finding him/her will not be easy but citizens can rest assured that the investigation will not cease until a culprit is found. Update: Austin bomber identified as Mark Anthony Conditt.